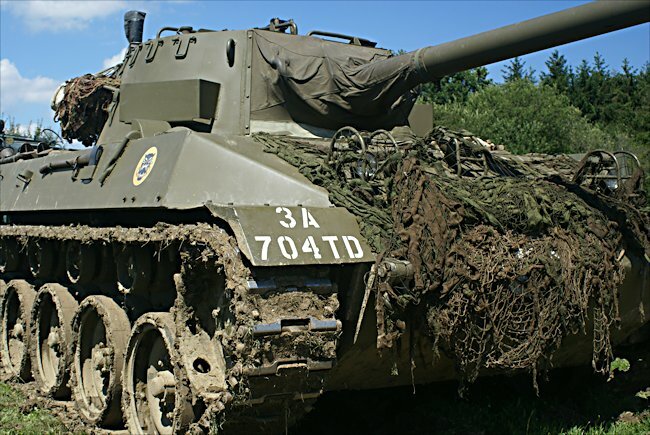 These two M18 Hellcat Tank Destroyers are in private ownership but can be seen at many of the military vehicle events during the summer in Britain. 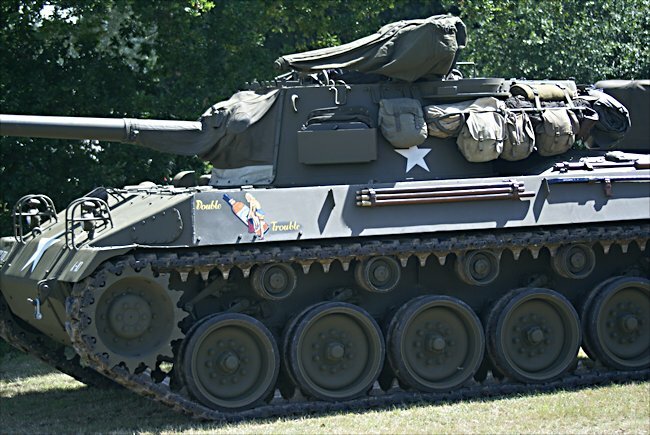 The US Army designation always starts with the weapon so the correct name for the M18 Hellcat Tank Destroyer is 76mm Gun Motor Carriage M18 or 76mm GMC M18. During the Second World War, the M18 Hellcat tank destroyer was the fastest armoured vehicle on tracks. It could leave everything behind the cloud of dust. Nothing was more nimble on the battlefield. It was the sports car of the tank world. There were 1847 M18 Hellcat tank destroyer made. Factory production of the Hellcat started in 1943. It first saw action in the hot summer of 1944 in Europe. Crews love the M18 for its speed and smooth ride thanks to the new Torsion Bar Suspension system. 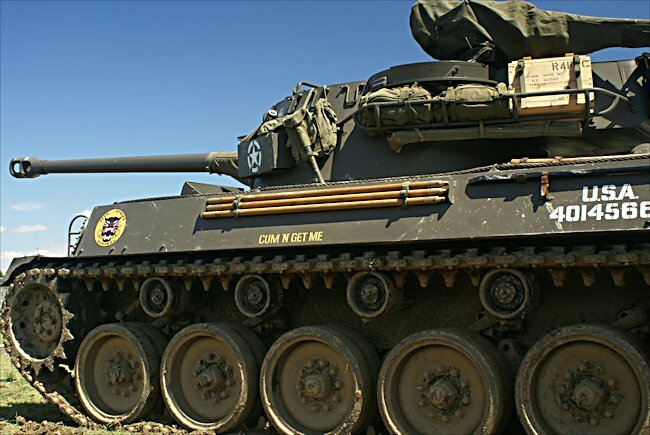 The modern M1 Abrahams main battle tank still relies on the same torsion bar suspension system. The M18 Hellcat tank destroyer's speed was legendary. It could crews at 53 mph. The American designers thought that the M18 Hellcat's speed would give it nine lives. It would be able to get out of trouble fast. Although the M18 Hellcat tank destroyer looks like a tank it is in fact not a tank. It has an open turret. It was not designed to attack infantry. This is why there is no coaxial machine gun by the side of the main cannon, or one built into the front of the hull. It was to be used strictly to engage other tanks. American tank destroyers were conceived as armoured vehicles that would race in front of the main attack, then lie in wait to ambush on coming German Panzer tanks. The M 18's purpose was to strike first and get out fast. It was a shoot and scoot approach to battle. The gunsight optic was very good. The gunners could target anything up to 2 1/2 miles away. The range of the Hellcat's gun made it a deadly force on the World War II battlefields. They could fire at enemy tanks knowing that they could not fireback. Although the gun was the same 76.2 mm cannon that was fitted to the later Sherman tanks, the tank destroyer crews were issued with a special hot armour piercing round. It would shoot a superhot jet of molten steel through the armour. German tank crews counted this shell by fitting external metal plates of stand-off skirt armour. This extra plate helped defuse the molten jet and protect the underlining original armour and the crew. The speed of the M18 Hellcat came at a tremendous cost. The American designers gave it a very thin armour skin that some German heavy machine guns could pierce. 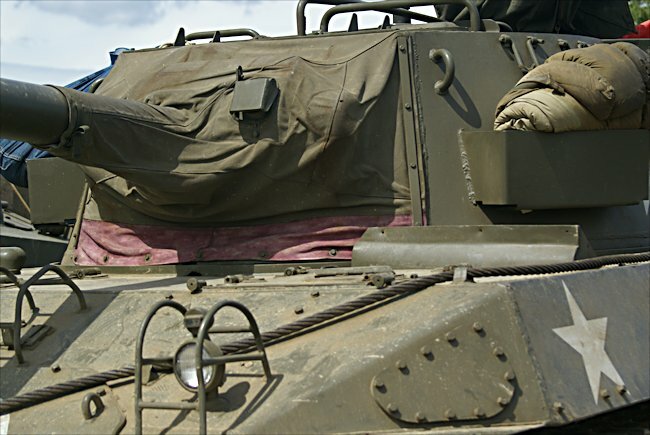 You do not always win a battle by who has the biggest tank, sometimes it is about how quickly damaged vehicles can be repaired and put back into the fight. 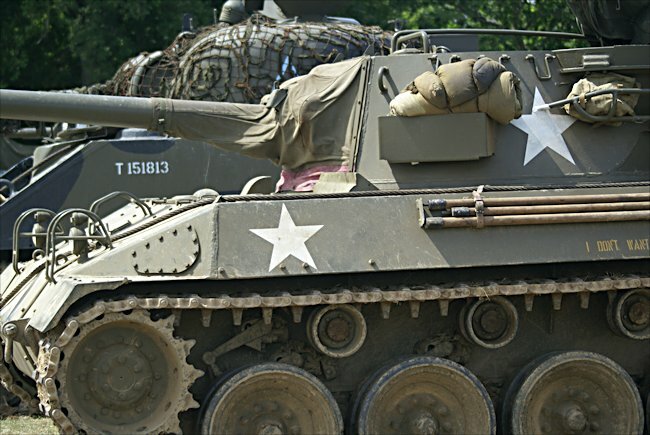 One of the impressive design features of the M18 Hellcat was the way the vehicle's engine could be quickly replaced or repaired. Within 20 min to men could undo the rear engine hatch and unattach the engine from the chassis. The engine then pulled out the rear of the tank on rails. Maintenance on the hellcat was extremely easy. The engines in the M18 Hellcat are rather interesting. They are an aviation radial engine and they are air cooled. There was no radiator or problem with leaking radiator fluid when a stray bullet pierced it like you have on most of tanks. There is one disadvantage for the crew though. Air is sucked into the engine compartment through the crew area and this meant in winter. It was very, very cold. Most people cannot understand why the M18 Hellcat had open turret. On the battlefield, he who sees the enemy first can normally shoot first. Hellcat tank destroyer commanders surveyed the ground from open cockpit. It was much easier to scan the horizon targets, looking out over the side of the turret than being battened down inside a normal tank turret, and looking through a periscope. The M18 Hellcat had to shoot first and change position. It's thin armour could not take much punishment. The big disadvantage was that the commander and gunner could be picked off by enemy snipers. Where can I see more M18 Gun Motor Carriage Hellcat Tank Destoyers?